We are not consistent in how we separate language and lexical category. We consistently separate language and lexicographical category with a localizable comma in all 3 places. T195443: Separate lang and category with a comma in Lexeme "description"
Lea_Lacroix_WMDE added subscribers: Lydia_Pintscher, Lea_Lacroix_WMDE. Lydia_Pintscher merged a task: T195443: Separate lang and category with a comma in Lexeme "description". Lydia_Pintscher added subscribers: VIGNERON, Aklapper, WMDE-leszek. Would that go through a function of some sort that renders the Word/Language combination? Or would this be defined in CSS what the sepreator is? In any case, I have few preferences except that consistency would be great. Editors: preferences please :) Then we can pick this up. @Amire80 maybe you can give some input? The first example with the comma certainly looks better than the other ones with no separator. As far as I can see, and as @Bugreporter has already written above, the message with the comma is implemented using the optional message wikibaselexeme-presentation-lexeme-secondary-label. It's default value is, expectedly $1, $2. It's a good default. I could imagine some other clever and more generic schemes, for example to use a | as a separator, but it's not really needed, and a comma is good enough. If anybody thinks that a comma is not good enough, I'll be very interested in seeing an example. Languages where something other than a comma and a space is needed can easily customize it by editing the translation at translatewiki. The presentation without the comma is implemented using the message wikibaselexeme-description. 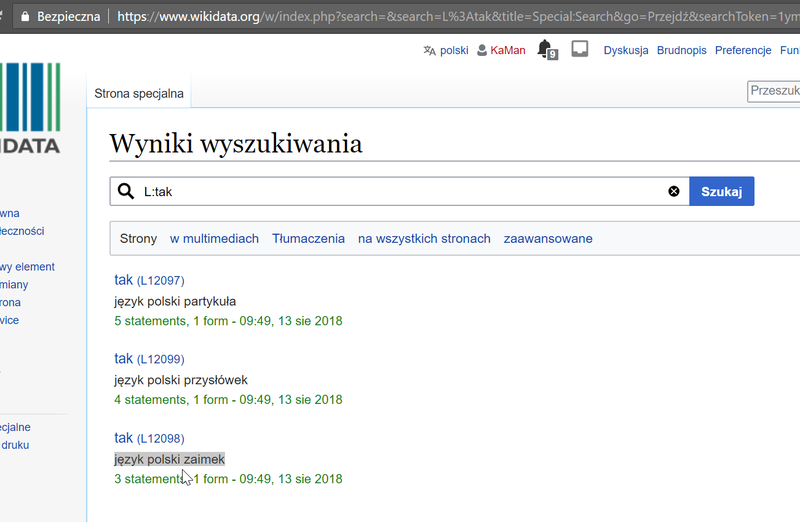 It's value is $1 $2, and it's marked as "ignored" in translatewiki, which means that it's a message for internal technical use and cannot be translated. This designation is probably incorrect. To use wikibaselexeme-presentation-lexeme-secondary-label consistently in every place where showing the lexeme and the part of speech is needed. To examine the usage of wikibaselexeme-description. Perhaps it can be completely removed and replaced with wikibaselexeme-presentation-lexeme-secondary-label. If it's needed, then perhaps it can be changed to $1, $2, but there should be proper justification for having an identical message. If this is done, then this message should be defined as optional and not as ignored in the translatewiki configuration repo. Having identical messages is not necessarily bad, as MediaWiki's Localisation guidelines say. I can think of at least one good justification for having two messages: one can be presented as plain text, which would be good for tooltips, and another one can be parsed with wiki syntax, for showing in context where HTML is available. (The messages don't have markup at the moment, but some languages may want it, for example for fixing RTL issues.) There can be other justifications. But this is really a questions that people who are well-familiar with the code should answer. I'll be happy to give more L10n advice if needed. I'd be happy to go deeper into lexicographical and dictionary design advice, but I don't think that it's needed here, at least for now. Actually there is already a separator: a spacebar. In the ideal situation, the separator should be localizable. For example Chinese and Japanese might prefer 、(or · ) rather than a Latin comma. But this is a very technical usage (i.e. not dictated by natural language grammar) so I can't speak for the preferences of other users. In the short term, both comma and spacebar would be fine. I think speakers of non-Latin languages can cope with a Latin comma as separator, much like we have put up permanently with the utterly foreign and non-localizable Latin colon for namespaces. It's already localizable, as my comment above says. But I'm not sure why are there two messages and not one. In English the space separator can work well if you treat it as a phrase with an adjective (language name) that describes a part of speech, e.g., "Polish noun". But it won't work in many other languages. For example, in Russian, names of parts of speech have gender, and then the name of the language adjective will have to be in the same gender. While it's not impossible to generate correct phrases of this kind, it's not trivial either, and probably cannot be done with just simple messages. So it's probably better not to assume that it's a phrase. "Noun, Polish", looks more generic and probably more easily localizable. Alright. Then let's go with a localizable comma. Thanks for the input everyone! Lydia_Pintscher assigned this task to Greta_Doci_WMDE. Lydia_Pintscher moved this task from Needs Work to Ready to go on the Wikidata-Campsite board. Lydia_Pintscher added a subscriber: Greta_Doci_WMDE. Greta_Doci_WMDE edited projects, added Wikidata-Campsite (Wikidata-Campsite-Iteration-∞); removed Wikidata-Campsite. Greta_Doci_WMDE moved this task from To Do to Doing on the Wikidata-Campsite (Wikidata-Campsite-Iteration-∞) board. [mediawiki/extensions/WikibaseLexeme@master] One comma was added to wikibaselexeme-description and respective test files, to separate language and lexical category.